Aloha Friends! I feel like a bit of a stranger since I haven't written a blog post in so long. With our fast paced lifestyles these days, who has time to write, let alone read blogs, lol! Most of my posts are about teaching and improving our classroom strategies and environments. We strive to be the best teachers that we can be. Goodness knows we set out to change the lives of our students and not to become millionaires. However, as I approach the next phase of my adulthood, I realize that I really should have learned how to care for myself more and invest in my future, not just for me but for my own children. As a teacher there's not a lot of wiggle room for investing and now as a single mom of two teenage girls, I find it to be even less so. 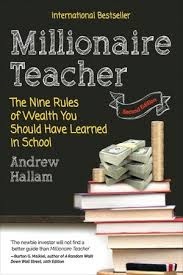 Recently I came across this book by Andrew Hallman after hearing many of my blogging/teacher cohorts rave about him at the Teachers Pay Teachers conference. I figured I would give it a read and see what he had to say and what I could do to start investing in my future. Andrew Hallman is/was a high school teacher who learned how to invest in the market and became a debt free millionire in his late 30's. Let me just say the first two chapters really got me thinking about how I spend money. I realized that if I were to really separate my needs and wants that it would be possible to sock away a little extra each month. I think I am pretty thrifty, but it really gives some sound advice about making bigger purchases like cars and home appliances. 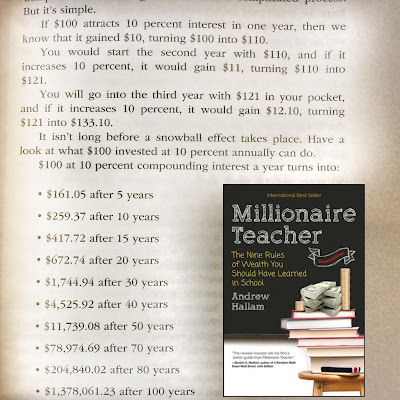 The rest of the book really takes you through the process of teaching you about investing in the stock market and what you should be looking for. I know, I know....Stock Market? Yeah, that makes me nervous too! Honestly all of that is totally foreign to me and it makes me want to run the other way. But, if you take the time to go through it and see what you CAN do, then it's not so scary. I am by no means an expert now, but I realized I have been letting a financial company invest in my 403b each month and not really questioning the mutual funds they have chosen for me. In the book Mr. Hallman reviews the difference between a mutual fund and an index fund. There is a big difference. Right away I looked at my latest financial statement and realized what I have invested is not growing much. It's time to meet with my financial guy and really get down to business. So imagine you are investing $100 a month instead of a year. That's a lot more to retire on than what I can possibly put away in the next 12 years before I plan to retire. However, it does help me to invest in my daughters' futures and to help them learn to invest now in their teen years! In the beginning of the book the author discusses how many of us were never taught in school how to invest and handle our finances. It is such an important thing for all of us to know. My parents didn't teach me to invest, but told me to pay my bills and save for a rainy day. If you are a newbie to investing, this book is a pretty easy read to help you get started, or at least thinking about how you can delve into your own investment portfolio. I plan to meet with my financial advisor soon and use some of my new found knowledge to invest more wisely. Are you on your way to millionaire status or at least a comfortable retirement? How did you learn to invest? Did you teach yourself? Please share your wisdom for all of us to learn! !